Sterling Silver Locket Pendants and Necklaces - Contact me if you would like to purchase a chain length that is not offered. To compare necklace lengths. Classic, versatile, timeless. 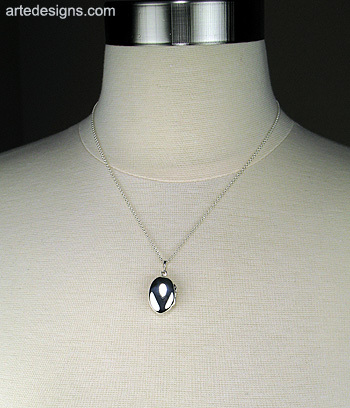 This small sterling silver oval locket can also be engraved. 3/4 inch H x 9/16 inch W. Adjustable 16-18 inches or 18-20 inches sterling silver chain with a lobster clasp. 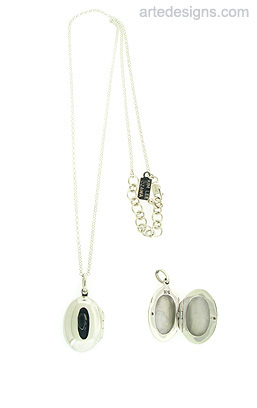 Classic sterling silver lockets that come in many sizes and styles. Heart lockets and oval lockets are available in smooth sterling silver, sterling silver with an etched design, or sterling silver with a filigree style. Arte Designs locket pendants are sold with an adjustable sterling silver chain. Choose a scent locket pendant or a locket for your pictures. Makes a great personalized gifts and can last for many generations.